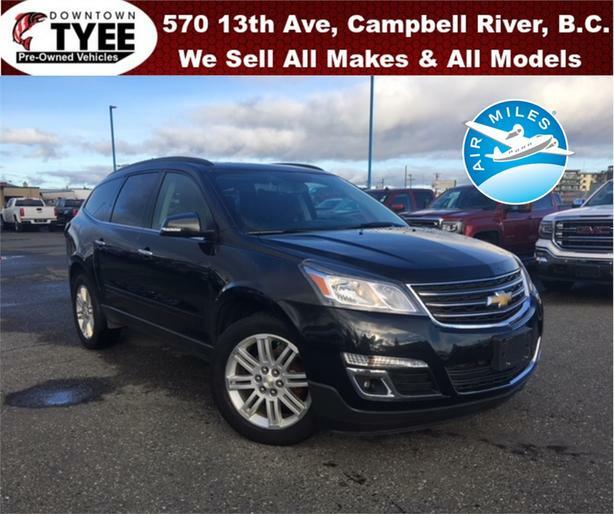 This 2014 Chevrolet Traverse is a large SUV that seats 7 passengers and comes in the LT trim level. Features includeautomatic headlights, roof rails, cruise control, front and rear air-conditioning, keyless entry, full power accessories, cloth upholstery, 60/40-split-folding third-row seats, a tilt-and-telescoping steering wheel, a trip computer, Bluetooth, OnStar telematics, a 6.5-inch touchscreen display, a rearview camera, 20-inch alloy wheels,foglights, heated mirrors, remote ignition, a leather-wrapped steering wheel, wood-grain interior trim and an eight-way power driver seat with power lumbar adjustments, dual sunroof and heated seats.Powering th 2014 Chevrolet Traverse models is a 3.6-liter V6 that produces 281 horsepower and 266 pound-feet of torque. ** For Sale at our Tyee Chevrolet Buick GMC store located in Campbell River, BC. Please contact us for finance/purchase options and further details. Trade-ins welcome. Serving North Island, Black Creek, Campbell River, Port McNeil, Sayward and Gold River. Also ask about our travel assistance for out of town buyers!! !